When you listen to some people talk are you stumped by the shorthand? I'm sure that many of us are familiar with text shorthands or even a few sports terms, but are you willing to put your skills to the test? 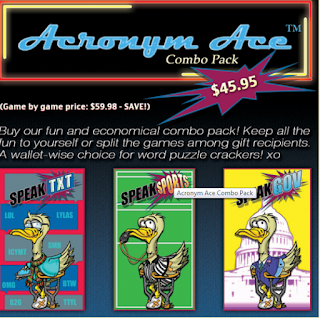 Parlicard Games is asking you to take the Acronym challenge with the Acronym Ace Series. In the latest games offer by Parlicard Games, players put their shorthand knowledge to the test. In this series of games, there are several versions including SpeakSPORTS, SpeakTXT, and Speak GOV (additional versions will be available in 2013). Each game has similar rules. Players can play against each other individually or in teams. A card is chosen from the deck randomly or you can choose a difficulty level. The person or team with the most correct answers win. Here's a quick summary of types of questions. Do you know your Federal Agencies or Federal programs? If you know the difference between GOP and GDP, this game is for you. Calling fans from the world of sports. Know the difference from between a TE and ER? Grab your buddies and put your sports knowledge to the test. Have you ever received a text and thought that the letters were missing? You might want to brush up on your shorthand to compete in this acronym game. The Acronym Ace games are intended for players ages 13 and older. With SpeakGOV, these cards could also be used as study aids for political science, history or other classes. Personally, I retained more knowledge when learning is fun. Each game retails for $19.99 or the whole series can be purchased for $45.95. It can be purchased at the Parlicards website or at Barnes and Noble. Would you like to play the Acronym Ace Series? I have the whole set, SpeakSPORTS, SpeakTXT, and Speak GOV to give to my readers. Please use the Rafflecopter to enter. Disclosure: The sponsor is providing the games to the winner. All opinions are my own. I'd try the sports version. i think I'd do pretty well! I think the texting version would be fun! We have teens who would probably kick our butts at this. All aboard game lovers. These are fun and funny and we can still get them to you for the holidays! Speak GOV. Thanks for the giveaway. I would like to play speaktxt. SpeakTXT would be fun to try! Since I am a Law student I like the SpeakLAW game. I would love to see if I could beat her. I would playing the texting version. I'd love to try SpeakTXT although I'm certain my daughter would beat me!